October 02, 2017 by Elizabeth B.
I saw a gallery wall in a magazine with these little skulls and was surprised to find them. They are exactly what I was looing for. March 23, 2015 by Traci R.
Love these little guys, just what I was looking for and arrived quick. August 25, 2014 by Pajm M.
Shipped as promised and without any damage. 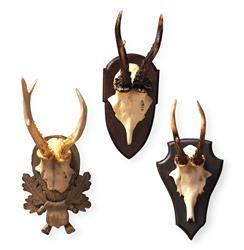 With these antler trophies displayed on the walls of your rustic lodge, you’ll never have to admit to coming back empty handed from the hunt… or having spent the day on the golf course instead. These three reproductions are so exquisitely detailed, down to the hand-distressed finish, that your secret is certainly safe.